There is a full range of courses for all levels offered by the Sprachenzentrum in Erlangen starting at the beginning of each semester. There are courses available in grammar, conversation, written German etc. 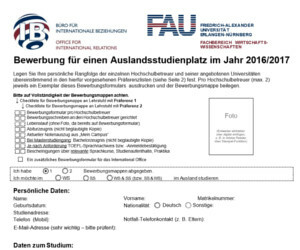 The WiSo also offers 2-3 German language courses (in Nürnberg) conceived especially for foreign students. We recommend these courses to all our international students. There are also intensive german language classes during the holidays organized by the International Office in Erlangen. 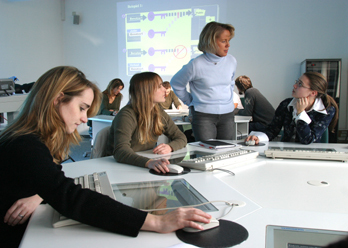 In the multimedia-lab the students may study European languages or German for business. International TV-programs may be watched as well. The lab is equipped with a wide range of information media including videos, CD-ROMs, audio cassettes, etc. Foreign students are invited to make use of this facility at any time. You may find the lab in the Lange Gasse, room number 2.430, Tel. 0911/5302-414. It’s open Monday through Friday from 10 am. on. The language center offers a broad spectrum of courses. It also has a department “German for Foreigners“, which offers German courses at different levels. Opening hours during non semester times: Monday – Friday from 10:00 to 15:00. For an overview of privately run language schools see the homepage of the Language Centerof the university (see above). Their courses differ in quality and price. The adult education centers, so-called Volkshochschulen, offer cheaper languages courses of different levels. They also offer intensive courses of different lengths. The WiSo has got its own libraries (Lange Gasse 20, Findelgasse 9 and Egidienplatz 23) with close connections to the university’s main library, and good computer facilities. The libraries in Nürnberg have an extensive collection of books not only on business and economics, but on the social sciences as well. Computer-based information retrieval systems are also available for the students‘ benefit. In order to be able to borrow books you have to register for a library card (you need your student card and passport) which enables you also to use the computers there. The other departments of the university’s library system in Erlangen are also accessible via computer from Nürnberg. Distance loan from other universities in Germany is also possible. All enroled FAU-students have free access to the university computer network. 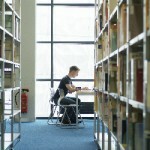 With it students can use the usual software or go online. The clearing of a student computer account is done by the WiSo computer center inNuremberg, Room LG 0.439. Office hours during semester times: Monday – Friday from 09:00 to 12:00, from 14:00 to 17:00 and from 19:00 to 21:00, Saturday from 9:00 to 12:00, from 15:00 to 17:00 and from 20:00 to 21:00. Whilst signing up for an account please ask for information on logging on to the FAU computer network and the use of the computer rooms. For further information please send an email to helpdesk@uni-erlangen.de or 0049-(0)911/5302-815. Students must fill in a user application form. The form can be obtained in the user advice office (Room LG 0.439). To complete the form students must fill in their personal data, i.e. name, city of residence, telephone number and type of work and sign the form. To obtain access authorization you must hand in – during office hours – a copy of your valid Student ID containing your user number and the user application form. Additionally you must present photo identification (passport or driver’s license). The account will then be cleared within one day. The Student Sevices Office Nuremberg runs the canteens (student restaurants) all year round. 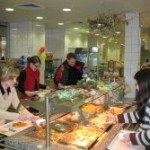 They are open at lunch times and offer diverse and affordable meals and salads and even vegetarian cuisine. For opening hours see down below. 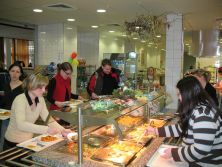 The cafeteria on the ground floor of the Lange Gasse facility also offers snacks and drinks during the day. The “Incorporated Society of International Degree programmes” exists since 2005 and aims in particular to support and connect international degree programmes. This student initiative offers students studying International Business Studies, International Commercial Law or Master of International Business the possibility to get involved and simultaneously to network. To do so Int-WiSo has its own homepage which serves as a contact platform for students plus there are five work groups covering different projects which are open to every interested student of the international degree programmes. Resulting from this there are many possibilities to get involved. For example, the work group “Event” focuses on boosting the student community by organising collective events such as pub nights, sports festivals or summer festivals. The work group “Business meets Int-WiSo” aims to establish contacts with companies. This collaboration results for example in lectures, events and workshops with such renouned companies as PriceWaterhouseCoopers, Roland Berger and Audi. 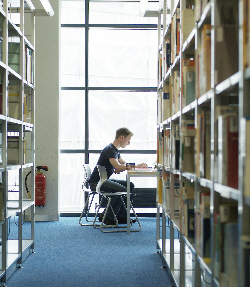 A comprehensive list of all student initiatives can be found under http://www.wiso.uni-erlangen.de/studium/service_fuer_studierende/studentische_organisationen_und_initiativen/.